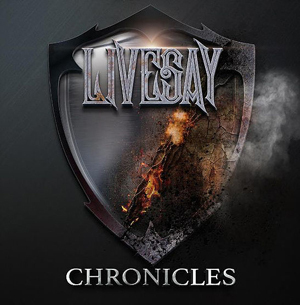 NY based Neo-Classical Rockers, LIVESAY, released their latest album Chronicles to a worldwide audience on November 30th via RFL Records. The band is extremely proud to announce the debut of their 1st video for the single “International Man”. The video was produced by HYDROGYN guitarist and producer Jeff Westlake and his Ridgeline Production Studio along with video production by Gail Corrow of Gail Corrow Photography. The clip features the new lineup, Gregg Livesay (Guitar), Mike Gill (Vocals), Tony Stahl (Keyboards), Keith Michaels (Drums) and Rich Andrews (Bass) and you can watch it now on KNAC.COM HERE. LIVESAY is a prime example of a band that has flown under the proverbial radar and has self-sustained 4 incredible albums – Livesay (1996), Darkest Hour (2000), Awaken the Giant (2010) and Frozen Hell (2016). LIVESAY is not a novice to the big stage and has opened for a multitude of hard rocks premier acts such as Ronnie James Dio, Y&T, Dokken, Lynch Mob, Ratt, Thin Lizzy, Vince Neil, Sebastian Bach, Quiet Riot, Michael Schenker, UFO, Fates Warning and many others. In addition to appearing at the Rock N’ Skull Festival 2 years in a row, they have headlined many times as well. With very little major backing, it’s been a willingness and belief that has driven this band. The new album titled Chronicles features 13 Tracks that bring the history of LIVESAY full-circle. From the earliest unreleased material from 1992's Demo Live & Let Rock to the best of 1996 – 2016 and culminating with the new track and single, “International Man" featuring new vocalist Mike Gill (BEYOND PURPLE). This album is certain to draw the attention of hard rock fans no matter what their taste. When it comes to hard charging performance – nothing less can stand up to LIVESAY’s Neo-Classical, Progressive Metal style – Whether it's Gregg Livesay scorching the fretboard, Mike Gill powering a melodic chorus, Tony Stahl’s electrifying keys or the wall of rhythm thunder from Keith Michaels and Rich Andrews – sound is of the essence – Catch LIVESAY and their Spectraflex CABLES tearing up a stage near you supporting their new album CHRONICLES in 2019.